The Malaysia/IBE-UNESCO project "Strengthening STEM curricula for girls in Africa, Asia and the Pacific" carried out a three-day Needs Assessment Workshop on Monday 18 January 2016, hosted by SEAMEO-RECSAM, Penang, Malaysia. The workshop gathered nearly 40 experts in STEM education and related issues, policy planning, curriculum, pedagogy and teacher education from Cambodia, Cameroon, Indonesia, Kenya, Malaysia, UNESCO Bangkok Office and IBE-UNESCO. The objective of the workshop was to share experiences on female participation in STEM in different cultural and social contexts as well as to develop country roadmap an intervention to mainstream gender sensitive STEM education into the national policies and the curriculum. During the three days, the Malaysian counterparts shared their expertise in developing STEM policies and a repertoire of strategies to attract girls in the STEM field. In Malaysia, girls outnumber boys in science studies. Likewise, Dr Florence Tobo Lobé, the Director of the Rubisadt Fondation from Cameroon, insisted on the need to change mindsets and cultural perceptions with regard to the participation of girls in STEM. She outlined a series of remedial strategies to address the gender gap in STEM, as demonstrated by the Rubisadt Fondation. In the morning of the first day, the IBE referred to the positioning of curriculum and learning within Education 2030. Likewise, UNESCO-Bangkok shared the main findings of the study carried out in Asia and the Pacific “A complex formula. Girls and Women in Science, Technology, Engineering and Mathematics in Asia”. 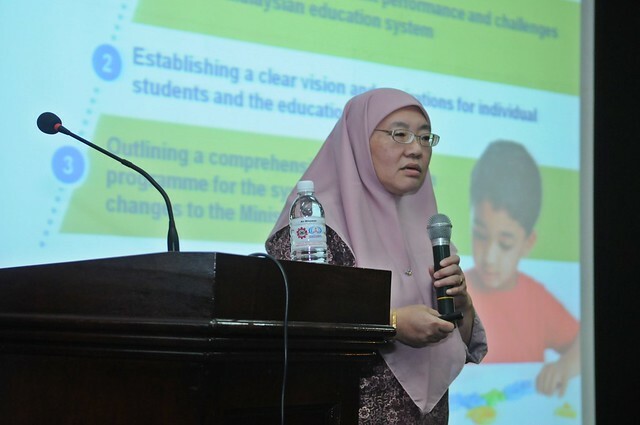 In the afternoon, Malaysian experts shared their experience with regard to the triad policy-curriculum-pedagogy in fostering STEM education. The programme continued with high-school students from the high performing girl school SMK (P) St. George (Penang, Malaysia) who were invited to share their personal experience and perception of what it means to be a female learner who wants to pursue a STEM career. On the second day, workshop participants visited the school SMK (P) St. George. Conversations with the principal and the teachers, and classroom observations led to a cogent reflection among the different stakeholders on different strategies to integrate STEM education through the curriculum and to ensure the real-life connections (application of knowledge). In the afternoon, focal points from Cambodia, Indonesia and Kenya shared the findings of their situational analysis carried out during the last six months. Their studies revealed the need to make the case for STEM policies within the processes of curriculum renewal and development. On the third day, country focal points elaborated their respective roadmap that will lead to field interventions during the following months, supported by Malaysia counterparts and the IBE. Country interventions are embedded in Education 2030, and in particular refer to the relevance of STEM as a laying foundation of sustainable, inclusive, and fair development. The IBE-UNESCO emphasizes south-south cooperation and the sharing of knowledge across regions. Malaysia expertise on STEM education is a clear example on how countries can benefit from each other.